I am a native of Charlotte and a graduate of UNC Chapel Hill and the Royal Veterinary College, London, UK. I have been practicing in the Asheville area since 2003. In February of 2009, I joined WNC Veterinary Hospital. I enjoy Internal Medicine, Surgery, and Ultrasonography. I have an amazing wife and two young children. I also have two quirky rescue dogs; Buddy and Docky. In my spare time I enjoy hiking, biking and running. I love spending time outdoors with my family. I am originally from Boulder, Colorado and attended the University of Colorado for an undergraduate degree in Molecular Biology. I received my DVM from Colorado State University in 2008 and following graduation moved to Knoxville, Tennessee for an additional one year internship at the University of Tennessee where I met my husband. I moved to Asheville in June of 2015 after practicing emergency medicine in Richmond, Virginia. I have a special interest in ultrasound, internal medicine, and soft tissue surgery. In my spare time, I enjoy spending time with my daughters Helen and Audrey, eating and cooking gourmet food and trying to keep up with my husband on mountain biking trails. My four legged family includes a Cavalier King Charles Spaniel named Ophelia and two orange kitties named Zufi and Marzi. I am a native of Lakeland, FL, but have resided in WNC since 1987. I live in Fairview with my husband Donnie, and stepson Alex. We have three dogs ( Zoey, Butter, and Gemma), two foster dogs (Buddy and ChooChoo), a cat (Titten), and various small animals and reptiles. I have a background in retail management, but finally found my passion when I joined WNC Boxer Rescue as a co-VP and foster in 2011. From there, I pursued an Associates of Applied Science degree at AB Tech. I have completed my degree, took my state and national exams, and am now an RVT. 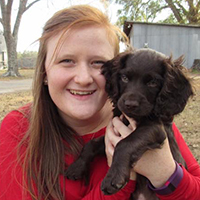 I joined WNC Veterinary Hospital in 2012 as a volunteer and was quickly added on as a full time employee. In my free time I enjoy riding motorcycles and hanging out with friends and family. I have been in veterinary medicine for over 20 years. I previously worked with Dr Young at another hospital and was excited for the idea to work with him again. I joined WNC Veterinary Hospital in the Winter of 2015. Sometimes you will see me assisting the technicians as well, since i have been trained there too. I have an amazing husband, Jeff, a beautiful daughter, Riley, and crazy cat named Goobie. I love to be outdoors and spend time with my family. Ellen grew up in Maryland and moved down in North Carolina in 2011. She graduated from Appalachian State University with a degree Sustainable Development. In 2018 she graduated from AB techs veterinary technician to become a registered veterinary technician. She lives on a farm with her husband, three dogs, two cats, goats and ducks. Megan started her career working with animals in 2008. 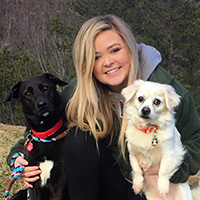 She has experience in Agility & Basic Obedience Training, managing daycare & boarding facilities, veterinary assisting and enjoys aiding clients (owners and their furkids alike) as WNC Veterinary Hospital’s Client Services Specialist. Megan loves all animals but certainly has a soft spot for the “bully” breeds!! Her Red Nose American Pit Bull Terrier named Swayzie is her best friend and adventure partner! In her spare time Megan enjoys hiking & kayaking, attending Carolina Panthers Football games, and creating art projects with her Partner, Ali. I am originally from New Hampshire, and moved to North Carolina 2 years ago. I have worked in the veterinary field for many years and have enjoyed all aspects of this field. I have a wonderful husband, two incredible children and three furry family members of my own. When not at WNC, I work as a fabric artist and enjoy long walks with the pups and hubby. I am a native of WNC and reside in beautiful Mills River. I started working in veterinary medicine in 2004. I currently reside with a feisty Jack Russell mix named Cooper and a pampered house cat, Big Fred. When I am not spending my days at WNC Veterinary Hospital, I enjoy spending time with my beautiful daughter Evie, home improvement projects, and working out. I was born and raised in Myrtle Beach, SC but have recently spent the last three years in Charlotte, NC. In January of 2019 I moved to the Asheville area and have been loving mountain life ever since! I originally went away to grooming school in 2013. After spending five years grooming for private and corporate hospitals, I decided to focus more on the customer service and medical side of the industry. In my spare time I enjoy hiking, fishing, boating, and movie nights with my boyfriend and family. We have two dogs. We have a lab mix named Trout and a Pekingese mix named Sammy! Carly grew up on the Eastern side of the state. She moved to Asheville in 2016 to attend AB Tech’s Vet Tech program. She became a registered veterinary technician in 2019. She did her externship with us during the summer of 2018 and then joined our team in December of 2018. On her days off she enjoys spending time outside or with friends.